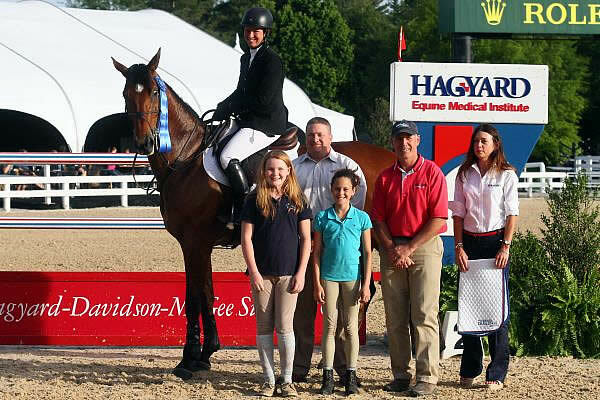 Lexington, KY – May 12, 2012 – The Kentucky Spring Horse Shows began on Wednesday, and one of the highlight events was the kick-off of the 2012 Hagyard Challenge Series, sponsored by the Hagyard Equine Medical Institute. The Hagyard Challenge Series consists of seven grand prix classes to be held during the 2012 show series at the Kentucky Horse Park. Following the final event, a cash prize of $50,000 will be awarded to the rider accumulating the most points throughout the series. The Kentucky Spring Horse Show, held May 9-13, 2012, featured the lead-off event on Friday night with the $50,000 Hagyard Lexington Classic. The top riders from across the nation gathered to compete over a challenging course and vie for the winning title and valuable points towards the $50,000 Leading Rider Award during the U.S. Show Jumping Team Observation Event. At the end of the night it was Beezie Madden and Simon in the winner’s circle, and the talented rider now leads the in the standings. The Kentucky Spring Classic, May 16-20, 2012, will host the second the $30,000 Hagyard Lexington Classic, CSI 2* on Thursday, May 17. Later in the year, four more Hagyard Lexington Classic grand prix events will be held during the Kentucky Summer Horse Show, the Kentucky Summer Classic, the Bluegrass Festival Horse Show, and the KHJA Horse Show. The Series concludes with the $50,000 World Cup Qualifier during the Kentucky National Horse Show. Following that exciting competition, the winner for the $50,000 Leading Rider will be announced and presented with the prize by the Hagyard Equine Medical Institute. Several generous sponsors have helped make this exciting series event happen. These gracious supporters include: presenting sponsor Pfizer Animal Health, Audi of Lexington, Dean Dorton Allen Ford, Hagyard Flex-tra HA, Johnson Horse Transport, J. P. Morgan, Hallway Feeds, MWI Veterinary Supply, Powell-Walton-Milward, Kentucky Blue Blood Financial, and Stoll Keenon Ogden. Pfizer Animal Health, a business of Pfizer Inc., is a world leader in discovering and developing innovative animal prescription medicines and vaccines, investing an estimated $300 million annually in animal health product research and development. Pfizer Animal Health’s industry-leading U.S. equine product portfolio-broadened by the acquisition of Fort Dodge-now includes a wide range of biologics, parasiticides and sedatives / analgesics. For more information on how Pfizer Animal Health helps horses to live longer, healthier lives, visit www.PfizerAH.com. Proud to be the presenting sponsor of the 2012 Leading Rider Bonus Award. Dean Dorton Allen Ford, PLLC is a full-service accounting and business advisory firm providing services to clients of all sizes in a variety of industries. With Central Kentucky being known for its world-class horse businesses and culture, Dean Dorton Allen Ford has offered extensive accounting, tax, business consulting, and technology services to the equine industry since the firm’s inception. Equine industry clients from Kentucky and beyond gain comfort in working with Dean Dorton Allen Ford’s industry specialists who give unparalleled personal attention while providing accurate, timely services that exceed clients’ expectations. For more information, please visit www.ddafcpa.com. Audi of Lexington offers many automotive products and services to our customers. From quality new Audis to used cars, we know anyone looking for a new or used car, in or around Lexington, will likely find what they want at our dealership. We carry a comprehensive line of Audi vehicles, including the A3, A4, A5, S5, A6, A7, A8, Q5, Q7, and TT models, making us a good choice as your Lexington Audi car dealer. Our services include trusted car repairs, original Audi parts, and auto financing help for our customers. Call Audi of Lexington at 866-862-AUDI, or come a visit us. We’re conveniently located at 3000 Pink Pigeon Parkway, Lexington, KY 40509, and we are looking forward to helping you with your automotive needs. Audi of Lexington is proud to be a sponsor of the Leading Rider Bonus Award. Hagyard Flex-tra HA – Hagyard Pharmacy is a nationwide leader in providing the equine industry with the highest quality pharmaceuticals and healthcare products. Backed by over 50 Hagyard veterinarians, Hagyard pharmacy offers excellence in service and expertise. We are conveniently located on the campus of Hagyard Equine Medical Institute, across the street from the Ky Horse Park or visit us online at www.hagyardpharmacy.com. Johnson Horse Transportation, Inc. has over 20 years’ experience. We provide, top notch, state of the art equipment, and experienced horsemen who take great pride in giving your horses the same love and care that they get at home. Our knowledgeable drivers and friendly staff help to set Johnson Horse Transportation, Inc. apart to be simply one of the best carriers in the business. Johnson Horse Transportation, Inc. has built a valued, lasting reputation with the horse community as well as being a respected member of the National Horse Carriers Association. Put your mind at ease and let Johnson Horse Transportation, Inc. be your first call. Visit www.johnsonhorsetransportation.com for more information. Stoll Keenon Ogden is an established law firm representing clients on levels local and international with notable successes in Kentucky’s signature industries. Since 1897, our commitment to client service is demonstrated by enduring relationships built on honest, experienced and trusted counsel. With offices in Lexington, Louisville, Frankfort, Henderson and Morganfield, SKO offers a wide range of practices in order to best serve our diverse clientele. Learn more at www.skofirm.com. For over 45 years Hallway Feeds has been a family owned and operated business devoted to providing the highest quality products and services to the equine industry. Combining our wealth of experience with the specific needs of customers has resulted in both a national and international reputation of excellence for Hallway Feeds. For many years, world renowned horse breeders within Kentucky’s Bluegrass Region have relied upon Hallway Feeds to care for their highly valued stallions, broodmares and growing horses. Hallway Feeds are a staple in the stables of the leading racehorse trainers, hunters, jumpers, eventers, and other equine professionals. With a devotion to the horse industry and unwavering commitment to the most technologically advanced and nutritionally sound products, Hallway Feeds is poised to lead the specialty equine feed manufacturing industry for years to come. Powell-Walton-Milward is a fourth generation family business and has served the Lexington area since 1852 as the successor of the King Agency. PWM has grown to employ over 50 professionals who provide commercial and personal product lines and employee benefits for our clients. For more information about the Hagyard Equine Medical Institute please visit http://hagyard.com. For more information about Kentucky Horse Shows, LLC, in 2012, please go to www.kentuckyhorseshows.com.